If you follow me and my blog posts, you might remember Abbey and Eric’s wedding at the Trout Club in Newark back in May (click here to see their blog post!). Well… Katie is Eric’s sister!! Katie and Eric had a wedding photographer booked already when they called me but weren’t completely happy with how things were going. And Abbey and Eric had just received their images from me and Katie and Nick loved what they saw so they wanted to see if I would be available for their intimate Friday evening wedding at The Granville Inn in Granville in October. I was already pretty booked for October but I love when clients come to me from other weddings and I have a hard time saying no to those weddings if I’m available on their date… aaaand we had such a great time with Abbey and Eric’s families at their wedding so I had already established a little bit of a relationship with Katie and I wanted to work with them at their venue. So, I said YES!! 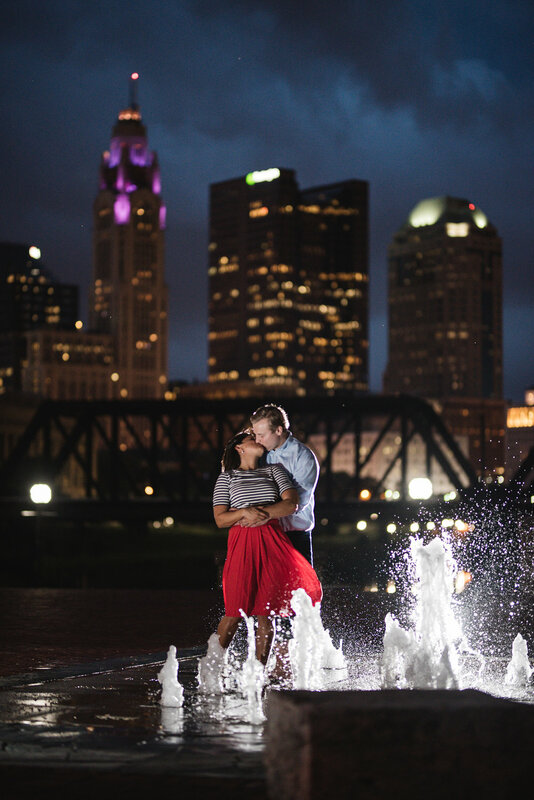 Because they had never had professional photos together they wanted to include an engagement session in their package and wanted to shoot at Mirror Lake at The Ohio State University and some kind of park if we could fit it in. Katie and Nick are so obviously in love and so happy and that is easily conveyed when they are together. Can’t you just tell? !